I opened the box from Amazon and was overjoyed to find...bubble wrap!!!! Hooray! I love bubble wrap. 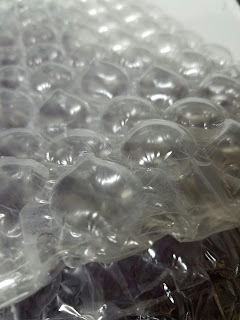 I can spend a good twenty minutes just sitting there, poking each puffy circle, enjoying the sound of each pop. There's something satisfying about the entire exercise, almost akin to meditation for some people. I don't even remember what else was in the box, I was so excited. I put the box aside and curled up with the bubble wrap, listening to the the pleasant crinkle. Unfortunately, that's all I got to hear. This was the "new fangled" bubble wrap. The kind of new fangled bubble wrap that doesn't pop. I understand. It's more important for the bubble wrap not to pop, as its job is to protect stuff that is being shipped all over the place. Now it is reusable, which is good for the environment. Meanwhile, it is not so important for the bubble wrap to entertain me for twenty minutes or so. I know that things change. This may be an improvement. I feel cheated, however, so I am going to mope a little. How about those BIG air filled pouches (they come in our lego orders) You only get like 4 to pop, but they really pop. I am sorry the fun police stole your popping joy!